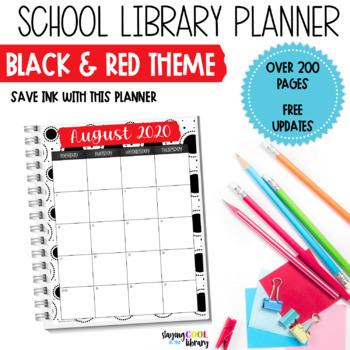 This is a planner designed specifically for the school librarian! There are over 200 pages to help you keep organized. 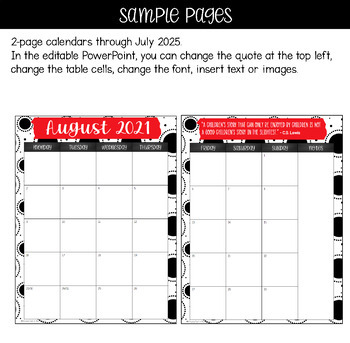 It includes pdf pages and customizable pages. You can organize the binder in many different ways. You can create one large binder or several smaller ones. And since this product will be updated every year, you will receive free updates for life! Just go to your TpT purchases page to re-download each year. Read below to see exactly what is included. ******Note: the preview file shows most of the pages but not every page. Also in the preview, the calendar pages show past years, the file is updated for the current school year. Also, on the editable pages only the text can be changed. The images cannot be changed due to copyright restrictions. You must have Microsoft PowerPoint installed on your computer to use the editable pages. 5 student surveys (appropriate for different grade levels, to find out what students read, what they like to read, reading habits etc. Cover pages. I inserted a text box on each spine label, you can edit the text boxes or delete them and write in your own text. Spine labels. I inserted a text box on each spine label, you can edit the text boxes or delete them and write in your own text. There are less pages in this planner than my other planners. This planner does not offer as many color options as the others. This is a more print-friendly option if you need to save on color ink.